Monarch butterflies (Danaus plexippus) are the most recognized members of the butterfly world, attracting attention as they fly thousands of miles from north to south and back again in a migration that spans several generations. Lately, the sharp decline in monarch populations has raised our awareness of the impacts of deforestation and habitat loss. The monarch has become a symbol of the fragility of our planet's interrelated ecosystems, as well as the mascot of gardeners who strive to make their backyards more welcoming places for wildlife. These lightweight, dangly earrings faithfully capture the patterns of a real monarch forewing, right down to the tiny spots along the wing's margin. 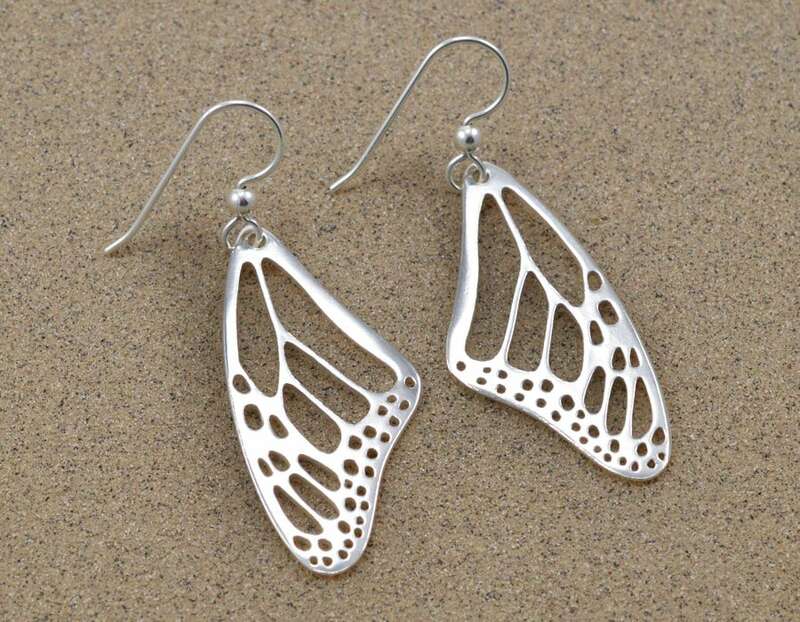 Cast in solid sterling silver from a hand-sawn original model and finished to a bright shine, they are just a little smaller than life-size, with a naturally graceful, face-framing shape. Beautiful and a really nice weight. Love these beautiful earrings! Shipped fast too. Thank you very much.